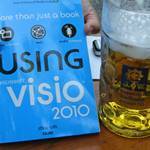 You are here: Home / News / Using Microsoft Visio 2010 Book is Here! 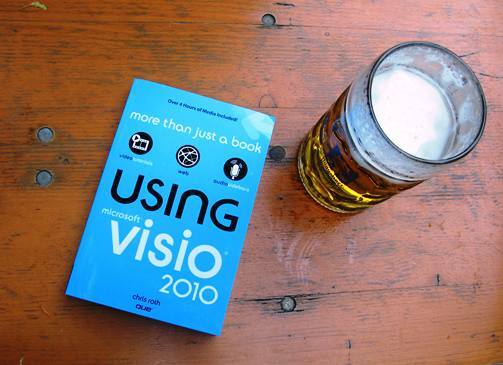 Using Microsoft Visio 2010 Book is Here! I got home today and found a mysterious package on my desk. Lo and behold, I was right! After anxiously ripping open the plastic shipping envelope, I held in my hands the physical manifestation of many months of hard work. 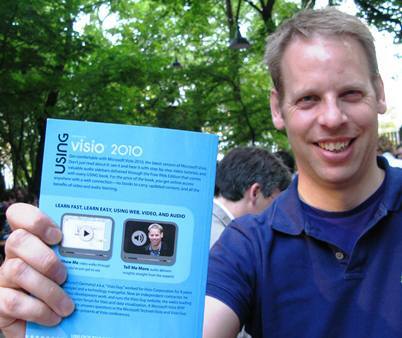 A shining copy of my introductory book on how to use Microsoft Visio 2010. Real paper! Glossy cover! The official title, ahem: Using Microsoft Visio 2010, and it is published by QUE Publishing. They’ve updated their Using series this year with a fresh new look. The books are shorter, have an easy-going format, include media elements and web companion materials, and are packed with step-by-step exercises to teach you the essentials of using the latest software applications. If that’s still too much to lug around, you can also get as a Kindle eBook. Working on a project like this is a lot of work, but holding the published result in your hands is really quite rewarding. I hope that my effort helps you complete your diagramming tasks more quickly, efficiently, and with more enjoyment and satisfaction. Note: Amazon says: “Available June 4th”, but you can pre-order right now. As you can see from the photos above, it’s definitely been sent to manufacturing! Update: Amazon is now reporting: “In stock on June 19th”. To those who’ve pre-ordered, sorry for the long wait. I’m not sure what happened, as I’ve had copies for some time now. Update 2011.o7.04: Copies have arrived in the U.S., U.K and Germany Woohoo! Hey Chris, Congratulations! Just placed my order. Maybe you can sign my copy next time you are in the bay area. Wow, very nice! Congratulation for the book!!! I really like your website, and as well the Biergarten in Munich ;)! It is very useful for my dissertation!!! Hi Visio Guy: I was delighted to see the Visio Guy logo at the top of my Google Screen! What a trip! How could I not visit this site! I have just received the book — it is just excellent. The on-line run-throughs are invaluable. The value is stunning — well done! Hi Chris, congratulations!!! I will order it for sure, guess it takes a couple of weeks until it will arive in Brazil! Anyway, to see the picture with the bavarian Biergarden makes it really hard vor an real Bavarian to be so far away!!! All best and good selling buddy! I’ve been working through this book for the better part of last weeks evenings. I decided to actualy learn to use visio instead of just muddle through the drawing of network diagrams and so far I’m loving it. Not only do you manage to present the topics in a clear way, you also do so in a very compact way, making it possible to pick up on a lot of useful stuff in a very short time, which allows me to learn the tool without it getting in the way of the actual work. It’s wonderful to hear encouraging words! 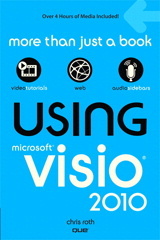 Purchased your Visio 2010 book on QUE Publishing. I like to look at it occasionally. Now I would like to go through it thoroughly. I tried to find on QUE some accompanying files for the book. Is there such a thing? Could be useful, especially for the bonus PDF document ‘Developing Custom Visio Solutions’. Thanks for the purchase, and good question. There are no “files to download” that accompany the book, other than the bonus Chapter 11 PDF file. I never packaged up all of the sample files because A. I thought it was a good idea for readers to work through it, and B. I just didn’t have the time, especially after the extra effort to produce all of the companion videos that come with the book. Maybe someday I’ll scrape them together and put them on this site, but I doubt I’ll have the time. A quick scan for *.vsd in my “book” directory revealed 182 items! Thanks very much Chris. No worries at all. Thanks for the reply and the lovely book. 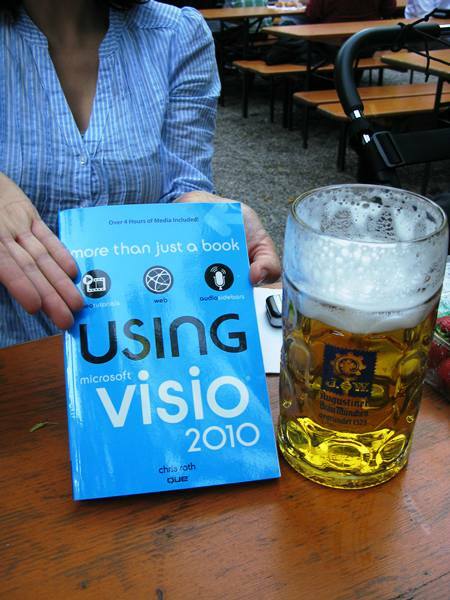 I just bought a copy of Using Visio 2010. I’m dissapointed that que publishing doesn’t seem to be offering any of the media files or Chapter 11 PDF files. Is there someplace I could download Chapter 11 and use the media files, if necessary.